“In consideration of all of the above, the fulfillment of the various conditions highlighted, the removal of the external impediments, and based on the advice I have been given by the Chief Elections Officer, I would proffer that the Commission would be in a position to conduct general and regional elections no earlier than late November 2019 with an official list of electors having a qualifying date of 31st October, 2019,” Patterson told Granger in a letter dated 19th March, 2019. Patterson added that originally, GECOM’s Secretariat had proposed that house-to-house registration would have finished in February 2020, but “based on suggestions emanating from the Commission and in my direct engagement with the Secretariat”, Chief Elections Officer Keith Lowenfield has advised that with a “significant increase in the allocated resources for that exercise and an adjustment in the management arrangements for some procurement activities” that projected finish-date could be brought forward by two months” – that would be December 2019. However, PPP elections commissioner Sase Gunraj said house-to-house registration is not provided for in any law or written policy. “It is not something that is based on any law or policy,” he told a news conference. At the same time, he said he had asked on a number of occasions for the policy that provides for house-to-house registration. “We have never seen it – a policy that is trumping the laws of this country,” Gunraj, an Attorney-at-law, said. The PPP elections commissioner said unspecified action would be taken. “We will not telegraph our options because the element of surprise is necessary,” he added. 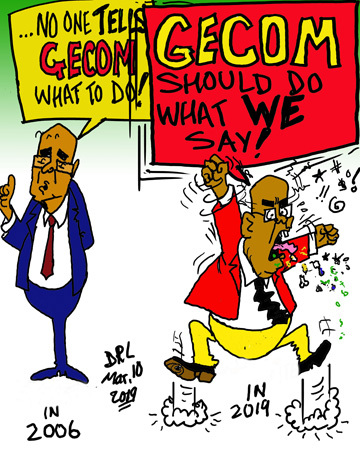 Gunraj further claimed that GECOM’s work programme was never unanimously agreed to. Fellow PPP elections commissioner Robeson Benn said he and his two other colleague commissioners were surprised by the letter because no unanimous or other decision had been taken by the seven-member elections body to write to the President. “This is a usurpation of the Commission’s functions,” he said. The PPP has consistently maintained that General and Regional Elections could have been held before the 90-day period – after last December’s no-confidence motion – had expired. At the same time, that political party and its three commissioners have accused GECOM and the governing coalition of conspiring to delay the elections. For its part, the coalition has cited the need for house-to-house registration to remove the names of emigrants and deceased persons which it says can be used to facilitate multiple voting. Why is the PPP so against having a house to house registration of eligible voters conducted? For a party who is gong ho in “taking back Guyana” , you would think that they would want to win an election that is based on a clean and honest voters list and not one that is bloated with false information. Perhaps that’s the only way they think they can win. GECOM has a responsibility to ensure that an accurate and up-to-date voters list is accomplished and, as such, carry on with the task at hand.